I’m kicking off a new column (on a new blog) today – reviewing coffee beans. Reviewing coffee in cafes is one thing – but if you want to make coffee at home – and you don’t want to buy from the St. Eutychus coffee shop (and why wouldn’t you) – then this is the column for you. And my Macap M4 grinder. I’m weighing my dosing too – to ensure a scientific comparison between beans. 21 grams is my standard dose. First cab off the rank was Five Senses Coffee. I’ve been following their blog for a while. It’s pretty excellent. They roast in Western Australia and Victoria, so when I ordered the beans on Monday morning I was not expecting to see them until today. But they arrived on Tuesday. What service. My only regret is not asking for a drawing of a bear fighting a unicorn. Which a recent customer did (inspired by a recent incident with a Dominos pizza order). 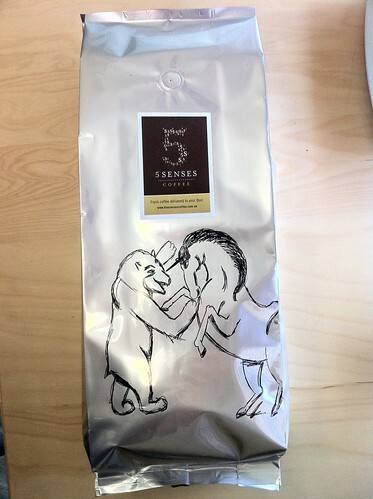 I ordered two 250g bags – one batch of their 24/7 blend, and the other a bag of their Dark Horse. Five Senses have a beautiful typographic logo, and their zip locked one way valve bags are a visual delight. I put both bags of coffee through their paces – as an espresso, a piccolo latte, a double shot flat white, and through the syphon (perhaps my syphon results need to be taken with a grain of salt for a little while – until I master properly). It took me a little while to dial the grinder in properly, but both blends were pretty drinkable in all the above forms. This blend stood up best as a double shot espresso (it was even better as a slow-poured espresso – sometimes I like to tighten up the grind a little bit and pour the shot for a lot longer you get a rich oily shot as a result). The tasting notes for the beans suggest you’ll get “red capsicum and slight savoury overtones” – which might describe part of the taste – and was particularly noticable when milk was added. The milk seemed to neutralise some of the more acidic fruity flavours. The notes also suggest a “cherry” flavour – and while I’ve only ever really picked up the exact same flavours as professional tasters once (an Ethiopian Harrar – where it’s almost impossible not to taste blueberry once you know it’s there) – there was certainly a pleasant fruitiness to the short black, and a savoury twang that wasn’t unpleasant. Here’s a video (using the iPhone Super 8 app) of the first shot. The syphon accentuated both the fruit and vegetable flavours. It was a bit like standing in the middle of a good greengrocer and drinking the air (with a dash of “generic coffee” flavour thrown in – it did still taste like coffee). This “flagship blend” promises to be a ripper with “everything you could want in a coffee”. Unfortunately drinking it didn’t make me rich or more handsome. But it did taste nice. The beans are sourced, direct trade, from PNG, where it appears they are pre-blended. I probably enjoyed this more than the Dark Horse, it was better balanced and closer to my preferred taste (I think at the moment I lean towards the chocolaty end of the spectrum rather than the fruity). It was really pleasant as an espresso but it worked better in milk. My wife preferred this one too. She said it was better balanced and less tart than the Dark Horse but that it didn’t have the same standout flavours. I agree. Once you get over the weirdness of a coffee that tastes like veggies – both of these produce great cuppas with their own selling points. The service and attention to design detail mark Five Senses out as a quality operator and the commitment to direct trade coffee for their signature blend is admirable. If I was going to order again I’d probably go with the 24/7 – but they do have a batch of other blends and a host of single origins to choose from. Five Senses sell 250gm bags of these coffees at $11 (plus postage) and mail them out super fast – a great solution to any coffee shortage – and admittedly a much quicker turn around than I can manage with St. Eutychus Coffee (because I roast to order).